How many people can stay at Uma Wana Prasta? This luxury estate has seven bedrooms in total, so we can accommodate up to 14 people at any one time. The master suite is on one side of the house and completely private with a king-size bed, stunning en-suite bathroom, separate office space and walk-in wardrobe. The other six bedrooms are on the other side of the house and all equally beautiful, complete with queen beds and en-suite bathrooms. One of these bedrooms can be reconfigured into twin beds on request. Two of the rooms share a bathroom, making them perfect for families. All bedrooms are air-conditioned. Do we get the property all to ourselves? Absolutely! Each booking will be exclusive and the cost of the stay will be scaled according to the size of your party. The smallest group we can accommodate is six and we can fit up to a total of 14 people. Does the property come with staff? Yes, Uma Wana Prasta is fully staffed. Our friendly English-speaking on-site manager will be there to greet you and to answer any questions you might have throughout your stay. There is also a full staff of housekeepers, butlers, chefs, gardeners and 24-hour security guards to make sure your holiday in paradise is perfect from beginning to end. If you require additional staff for parties or other events, this can be easily arranged with prior notice. A spectacular daily gourmet breakfast, prepared for you by our amazing chef, is included. You are welcome to add on as many lunches and dinners as you would like throughout your stay, but these will each incur an additional fee. Extra meals can be arranged in advance of your arrival or during your stay, but we require a minimum of 24 hours notice, and payment for these meals must also be made at least 24 hours in advance. You are welcome to work with our team to pick the menu for each meal or leave it up to our chef to surprise you with some delicious local specialties. Once you have selected your menu, the fee will be calculated on the cost of the groceries plus a 30% additional service charge. A food and drink deposit can be made in advance of your stay, and any unused funds at the end of the visit will be reimbursed. Wine, cocktails, beers and spirits are not included but can be supplied for a very reasonable rate. The direct costs vary according to your selection and a seasonal list is available upon request. And if we want to go out for a meal – where are the best local places to eat and drink? The culinary scene in Bali has boomed in recent years and there are so many terrific options. Some of our favorites include Da Maria, Locavore, La Lucciola, Rustica Cucina Italiana, Jemme, Mama San, MoVida, Ibu Oka and Ultimo. Our on-site manager would be happy to offer you some further suggestions and can help with finding somewhere suitable for your group. You just let us know where you want to go, and we take care of your transport and reservation. What activities can we enjoy at Uma Wana Prasta? In addition to our lush tropical gardens, numerous lounge spaces and two incredible pools, there are many other activities to keep you entertained. We can arrange for in-house massages, as well as other beauty treatments, wine tastings and cooking classes. Plus, the property features a grand piano, as well as a billiard room. What are the options for a day out? There are so many things to do in Bali – it’s a question of where to start. 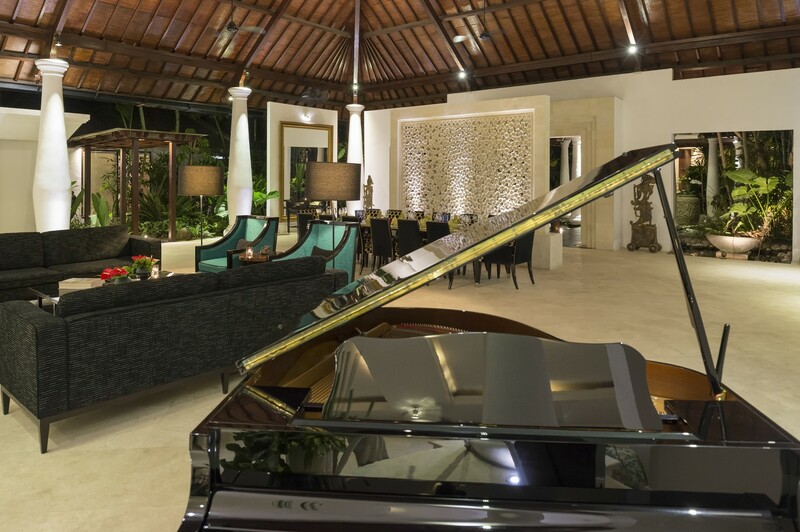 You could spend a day at one of the beautiful beach clubs that are within easy driving distance of the estate such as Finn’s Beach Club or the famous Ku De Ta, do a day trip to the gorgeous cultural town of Ubud, see the picturesque Tanah Lot Temple, spend an afternoon at Bodyworks Day Spa or test your swing at Nirwana Golf Course. How do we get around Bali? A car and driver accommodating up to five passengers is included in your booking for up to 10 hours each day. Extra transportation can be arranged on request for an additional fee. Is Uma Wana Prasta suitable for children? Yes, children are welcome at Uma Wana Prasta however the two swimming pools are not fenced off so guests are responsible for the safety of children at all time. Child minding can be arranged for an additional fee at any time. Is Uma Wana Prasta suitable for special events? Yes, Uma Wana Prasta is the ideal location for special events. From birthdays to weddings, reunions to hen’s gatherings, we would be very happy to help make your event one to remember. Our garden features a vast and beautiful grassy area that can easily accommodate up to 150 guests and is perfect for functions, and we have hosted full sit-down meals for 90 people in the under cover living space with a separate area for a dance floor. Our staff would be thrilled to work with you to plan your event – please get in touch with us to find out more. How do we get from the airport to Uma Wana Prasta? The estate is located near Canggu in the south of Bali, which is approximately one hour’s drive from Denpasar International Airport. Complimentary airport transfers are included as part of your stay. VIP airport and visa clearance services can be arranged for an additional fee on request. Bali is located near the equator, so it enjoys a warm, tropical climate that is perfect for a relaxing holiday. The dry season runs from April to September and the rainy season is usually from October to March. The temperature in Bali averages 26-27°C and humidity is usually around 85-90%. There are a number of Western-standard hospitals in Bali. Siloam Hospital on Sunset Road in Kuta has an excellent reputation. International SOS and BIMC both provide 24/7 ambulance services and medical assistance. Our staff are available to assist should any issues arise during your stay, and if you have a pre-existing medical condition, please let us know prior to your arrival. Is Uma Wana Prasta safe? Yes, Uma Wana Prasta is very safe. The property is protected by a team of 24/7 security guards. We are connected to all relevant early warning services and fully prepared for all eventualities. Please note that Uma Wana Prasta is surrounded by lush tropical gardens, adjacent to a jungle river valley. You may meet the local wildlife, from monkeys to geckos, and this is part of our unique experience. Should you encounter any animals that you don’t feel comfortable with, please just let our staff know and they will take care of it. Citizens from 169 different countries (including Australia, USA, United Kingdom and New Zealand) are granted a free 30-day visa on arrival in Indonesia. See the full list here. However, please be aware before booking that temporary passports are not allowed entry into Indonesia, and all passports must have a minimum of six months validity otherwise they may be denied entry into Indonesia. How do I find out more about Uma Wana Prasta? Feel free to contact us on reservations@luxurybaliestate.com at any time if you have any questions. You can also check out our Instagram and Facebook pages to learn more about our luxury tropical estate. What does Uma Wana Prasta mean? “Uma Wana Prasta” is Balinese Sanskrit and translates to “the Blessed House in the Forest”. Copyright 2015 UMA WANA PRASTA. All Rights Reserved.